I’m a big fan of DC’s “Designer Series” figures, where the artstyle of a particular DC artist is painstakingly recreated on a poseable action figure. 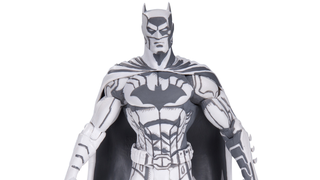 But this latest figure, based on the art of Batman: Hush artist Jim Lee, takes that design ethos to its most incredible extreme. The beautiful figure is one of DC’s exclusives for San Diego Comic Con this year, and revealed by USA Today earlier. The 7 inch tall figure will come in a box featuring a sketch of Batman by Lee (a “deluxe” $300 edition limited to a run of 150 for the show will come with a piece of original Lee artwork featuring either Batman, the Joker or Harley Quinn), but as lovely as it is to get a piece of Jim Lee artwork, the real beauty here is the figure. The colouring is impeccable, and the stark white and grey shading work really makes it stand out. The different smudges and shaded areas really do make it look like a pencil sketch that you just so happen to be able to pose. I mean sure, it’s another Batman to add to an ever growing army of Batmen, but it stands out by being so visually striking. The Jim Lee Batman will be available at SDCC this year for $40.